These are from air radiation monitors in Japan, they really do a much better job than USA. 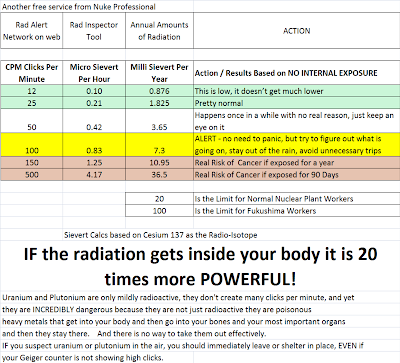 But use the "Geiger Counter Interpretation" chart below....at an EXTERNAL dose rate of 10 microSv per hour, people are taking around 100 mSv per year. That gives a significant increase in cancer in around just 1 month. 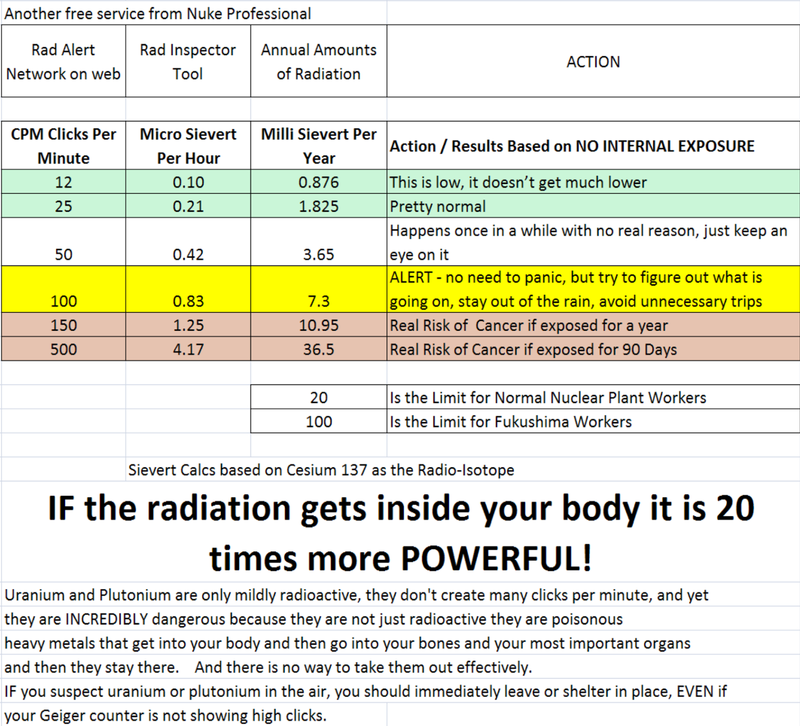 That if is the radiation stays outside the body. But if it's in the air, water, and food, OF COURSE it will become internal. And with bio accumulation and possible Alpha sources, the damage can be 20 times higher or worse it it's plutonium, and we know the tons of plutonium were aerosolized. Im sorry but you base your supposition on flawed LNT to estimate cancer deaths. I'm providing pushback from these ludicrous assertions. No I base my ideas on broad based epidemiological studies, some with over 300,000 persons. I admit LNT is flawed. Basing cancer risk on 2 nuclear bomb event in a very unique culture, over 70 years ago is pretty much plain stupid. Most radiation is going to have a supra linear curve, for LNT understates the danger. I dont buy it and neither does the established scientific community. 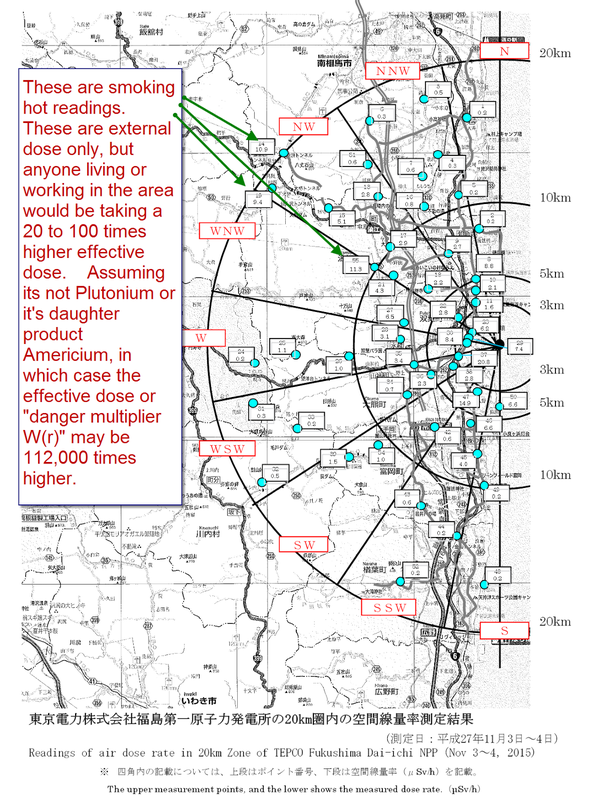 If you believe supra linear for low doses then you drank the antinuclear junk science koolaid pal. Im looking at a lot of sources, Harvard, AFRRI, CDC. You cant rely on epidemiology so much at low low doses because the uncertainty washes out any spikes. Its called a regression analysis for a reason. Sternglass found that out the hard way. Sorry, no sale.